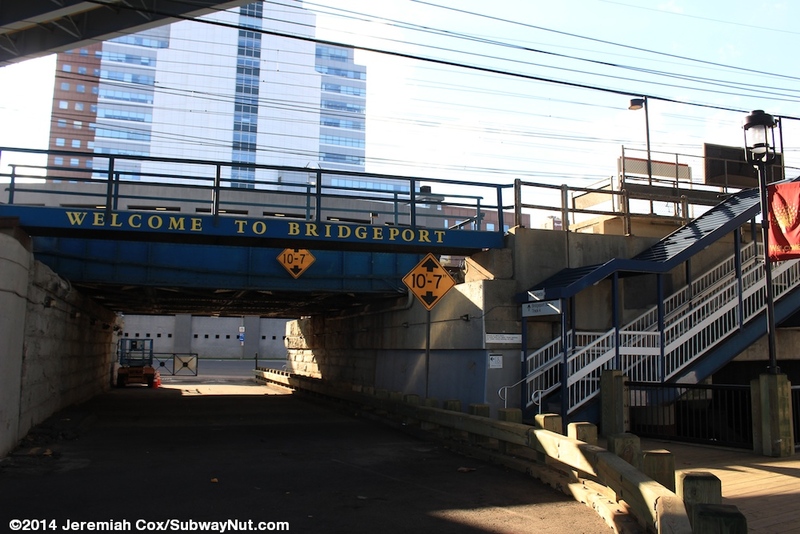 Bridgeport is an important stop on the New Haven Line. The current rail station was completed in 1975 and has a concrete Brutalist design. 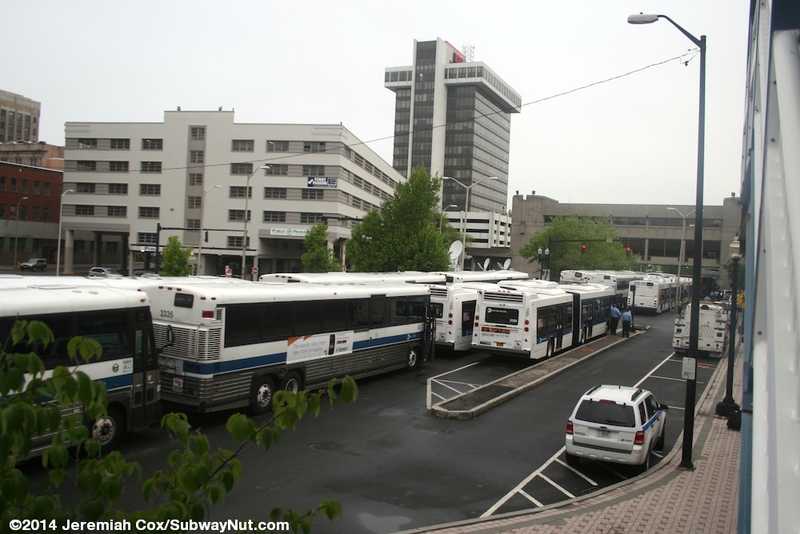 The addition of a modern bus station and parking garage in 2008 rebranded the station as the Bridgeport Transportation Center. 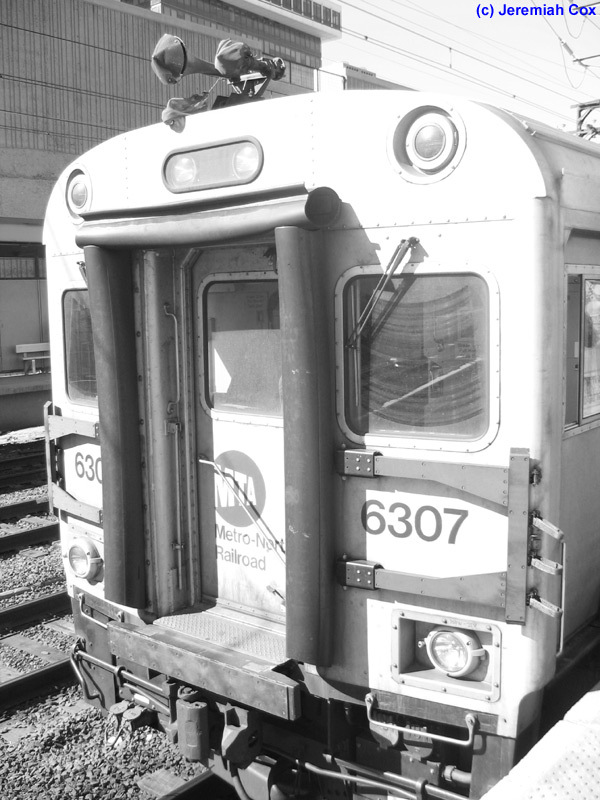 Every Metro-North Train that passes through the area stops at the station. 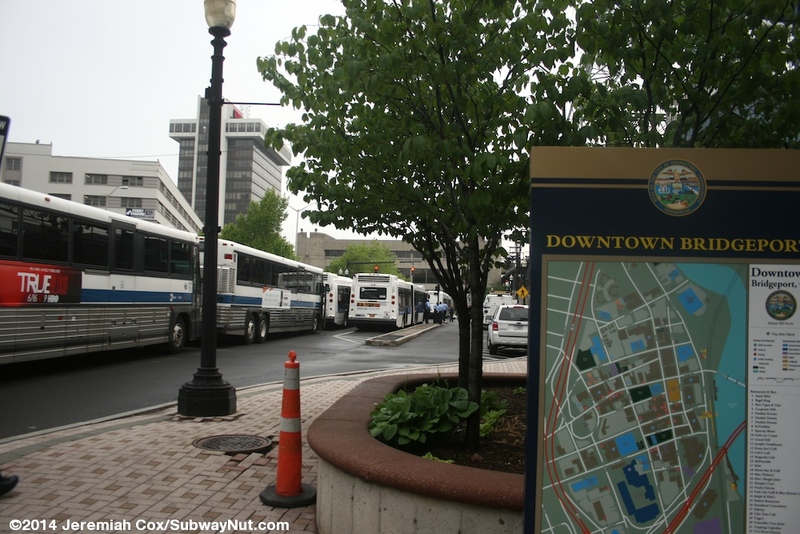 It is also the transfer point (except for one AM peak train that is extended to Stamford) to and from diesel Shuttle train service on the Waterbury Branch. The Waterbury Branch doesn't actually begin until after Stratford, one station further east. Amtrak also serves the station with the daily Vermonter and most Northeast Regionals making the station stop. 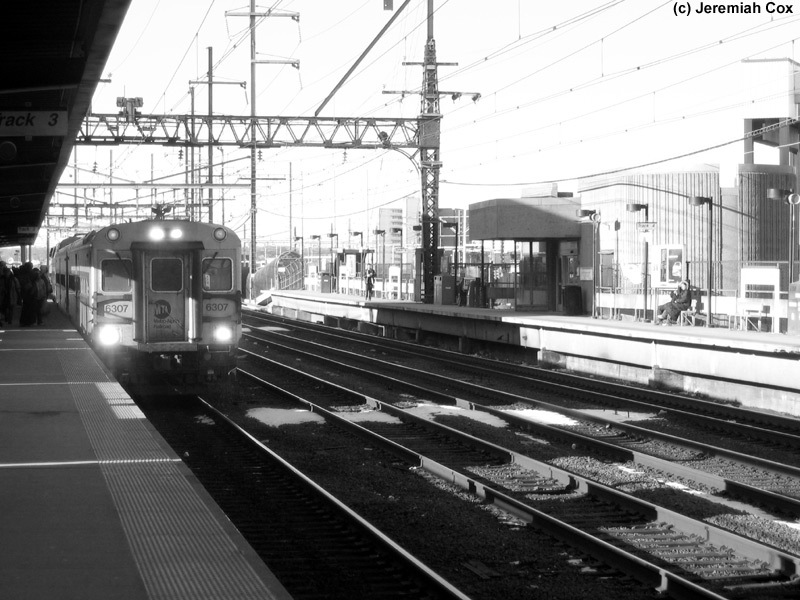 All Acela Express trains bypass the station. Although the station is an important transfer point, the station layout doesn't reflect this. 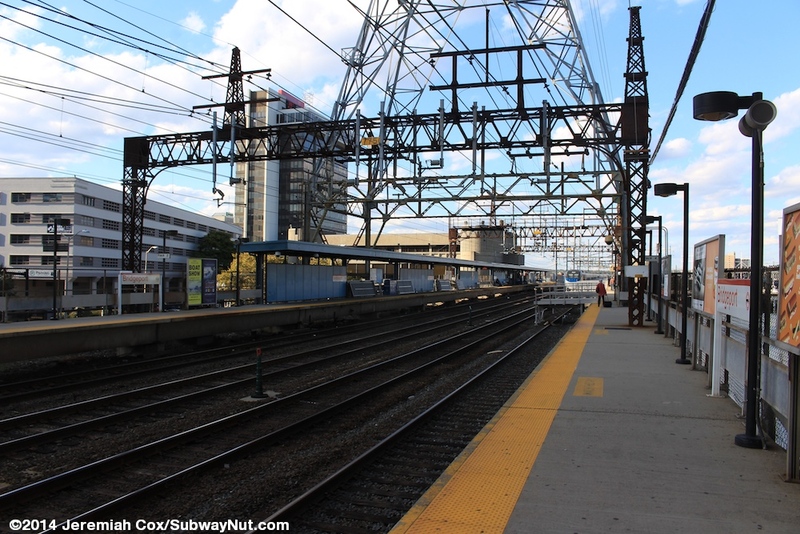 The stop has just two 8-car long side platforms along the outside tracks of the 4 track Northeast Corridor here. The station is up on a concrete embankment/viaduct. There are no extra siding tracks beyond the station, just the Port Interlocking where switches connect all four tracks just west of the station. 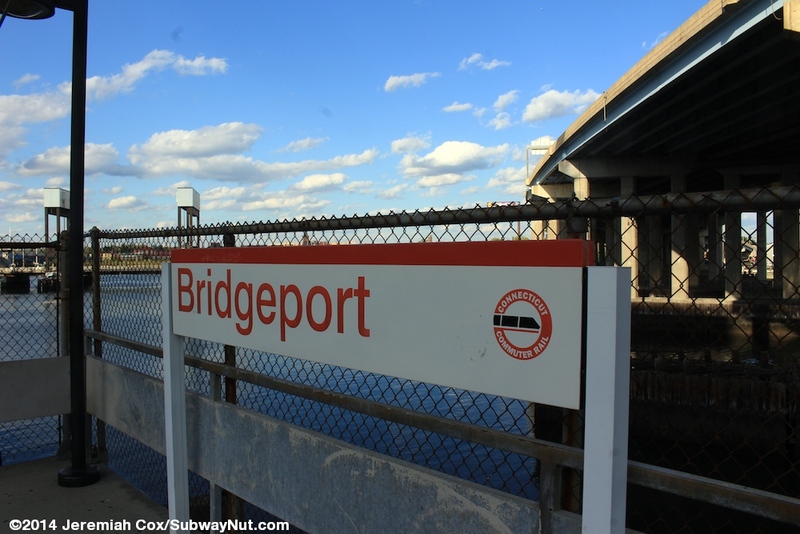 This makes the Bridgeport Shuttle have a complex turnaround operation by first arriving on the New York-bound track to fumigate. 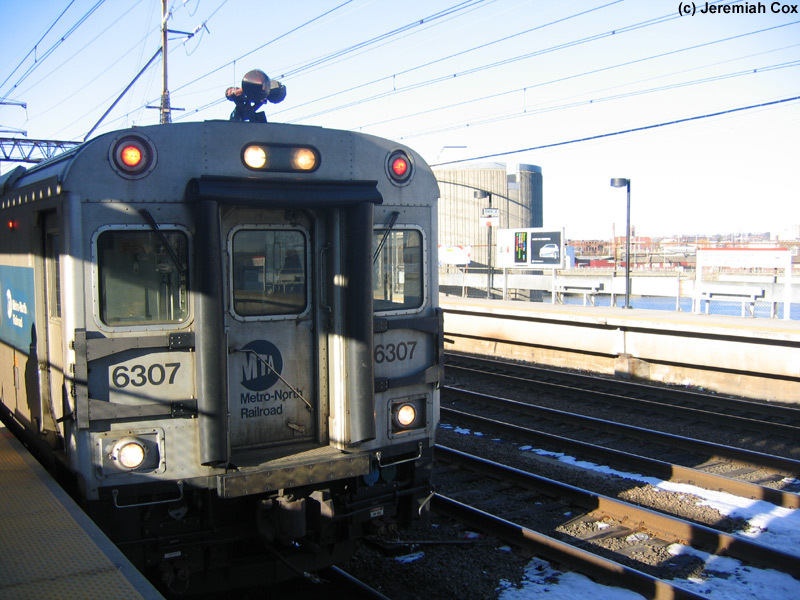 Trains than use the switches and layover (scheduled for only about 20 to 30 minutes) directly on one of the middle express tracks before a New Haven-bound train arrives, connecting passengers get off and wait on the platform for the shuttle train to re-enter the station on the opposite platform, pick these passengers up and head north to Waterbury. 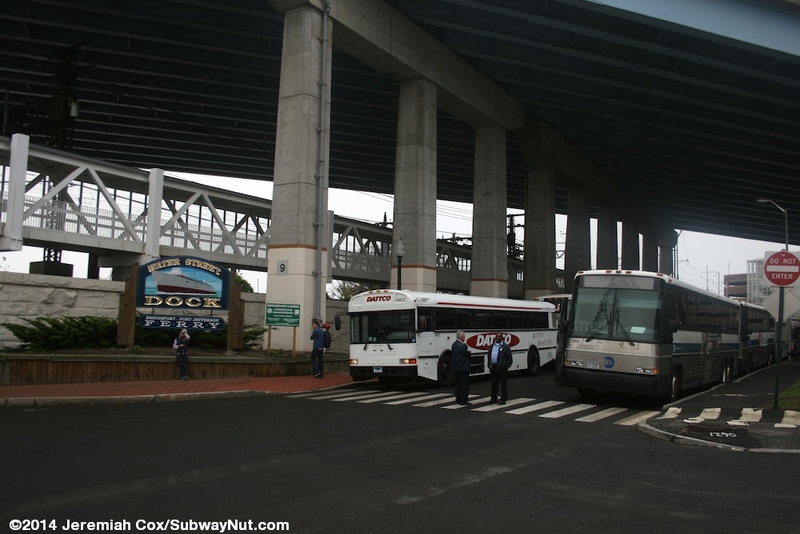 The stop is intermodal with ferry and bus connections. The ferry to Port Jefferson, Long Island departs from a dock just south of the station (on the opposite side of the I-95 bridge across the Pequonnock River) along this waterfront. 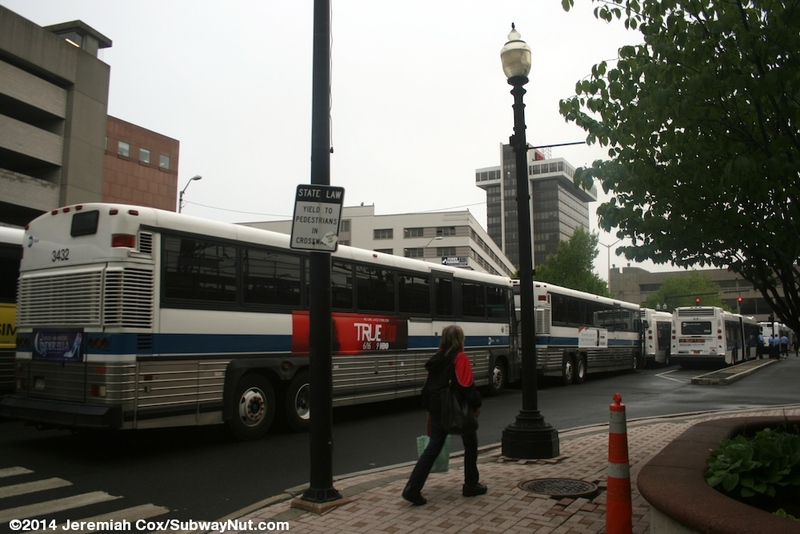 Passengers needing the ferry can simply leave the Metro-North platforms and walk along the wharf to the docks. Trains curve and cross the Pequonnock River heading northeast just after the station stop. 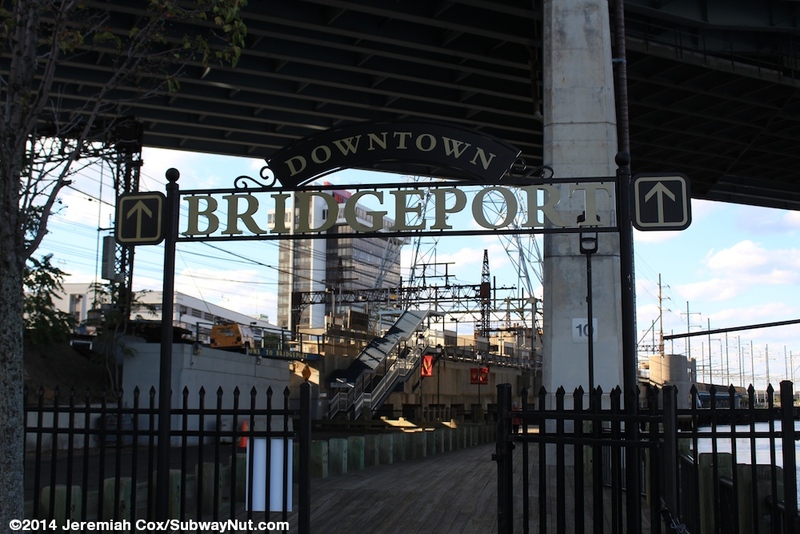 Also north of the station is the modern Bridgeport Transportation Center, opened in 2008. A long 600 foot white pedestrian bridge leads from the northern end of the New York-bound platform across Stratford Avenue and to the modern bus station. 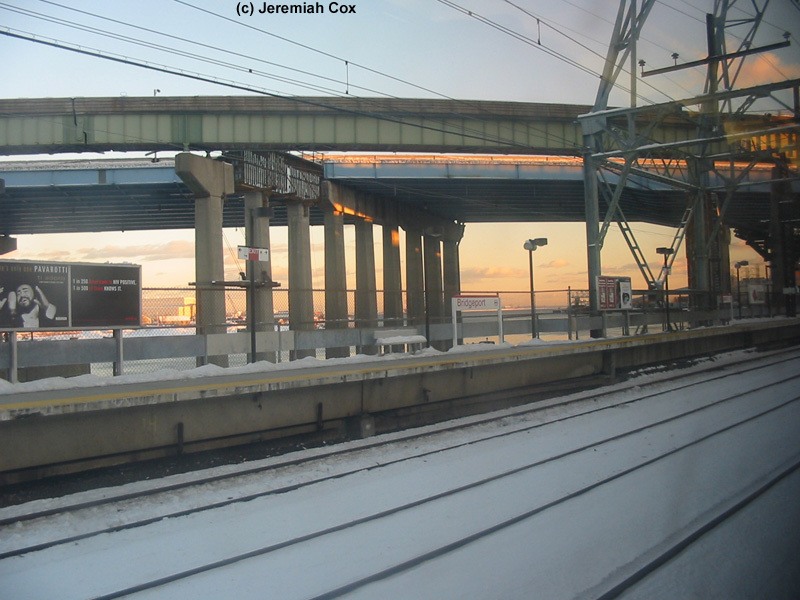 The station is directly along the Pequonnock River with the New Haven-bound platform directly hugging the river with portions build on concrete piers over the river. This platform offers views of the industrial waterfront from the 1970s decaying railings with a chain link fence behind it for further protection. 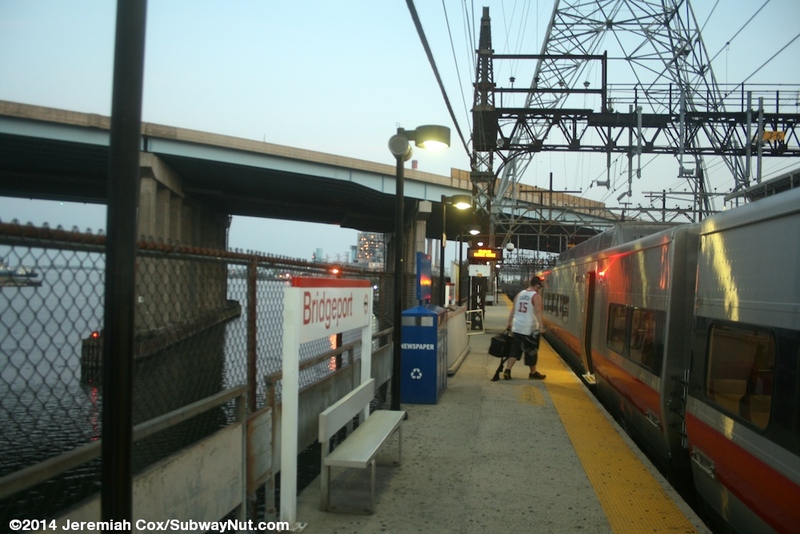 The two side platforms run from just north of where I-95 (the Connecticut Turnpike) crosses the river and above the rail line to just a bit south of Stratford Avenue. 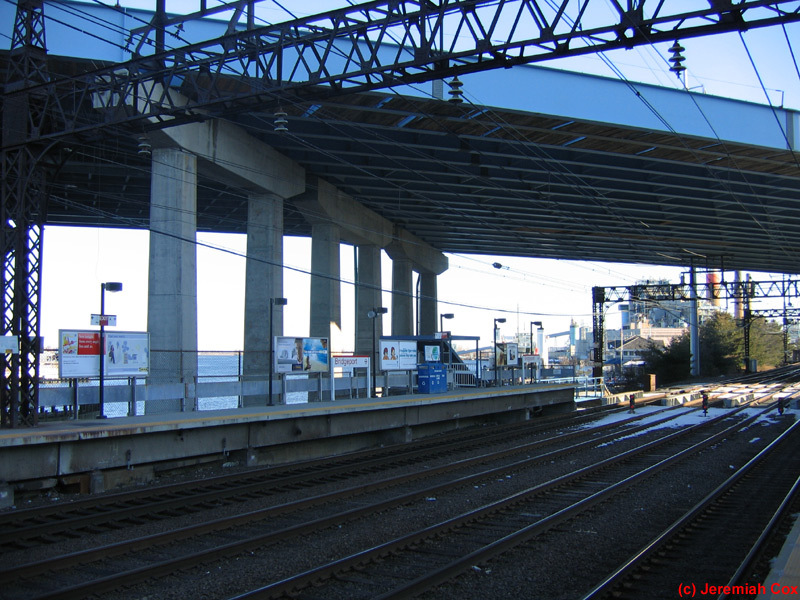 The station is parallel to Water Street just to the east. The New York-bound platform is nearly fully canopied except for a couple cars at its northern end. The canopies are flat, painted blue and have a few blue windscreens to match. The New Haven-bound platform is basically completely open to the elements. A third of the way from the northern end of the platform is the station'	s very unique station building that spans Water Street. Two circular concrete forms hold up the two-story building where elevators and staircases are. On the west side a wide staircase leads down into a plaza along Water Street. The main level has a wide waiting room with plenty of modern red benches nestled above the street. 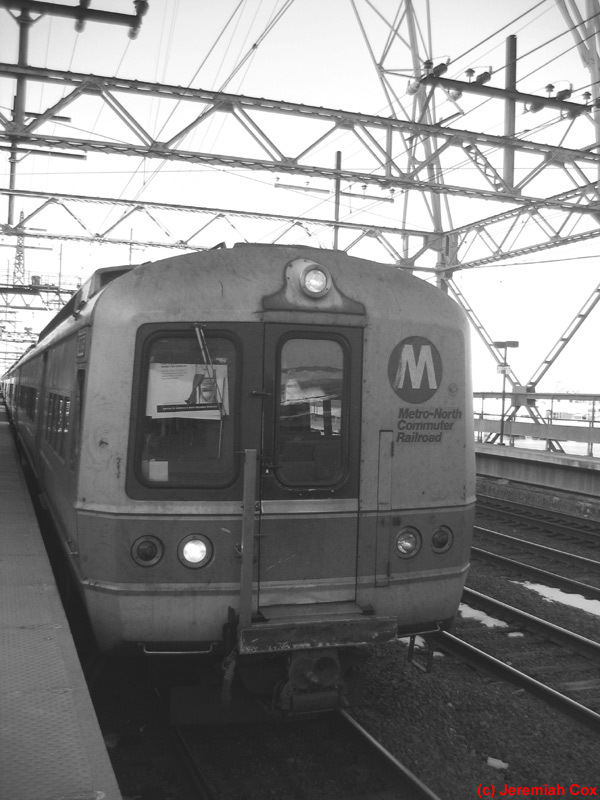 There is also a Metro-North ticket office, TVMs for Metro-North and a QuikTrak Machine for Amtrak. A convenience store/newsstand is open all day. An upper floor above the waiting room is for offices including a Metro-North police substation. Doors lead directly out from the waiting area to the New York-bound platform. To reach the New Haven-bound platform, passengers must go down to street level (where an exit is to the east side of Water Street) via stairs or an elevator and use an enclosed underpass tunnel, lined with an abstract mural of fish that leads to stairs and an elevator up to a enclosed waiting area along this platform with a few benches. 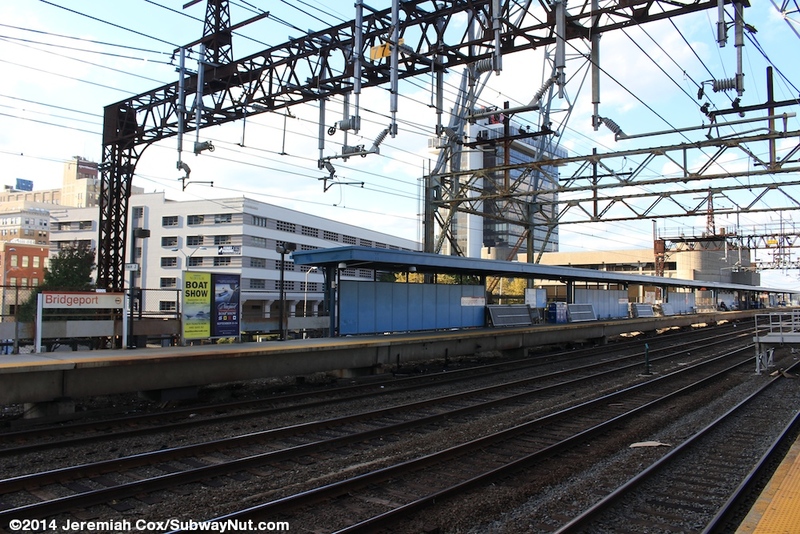 Outside of here a tiny concrete like awning provides the only cover for passengers waiting on New Haven-bound trains. There are additional staircases up to each platform at each end of the station. These are each completely covered by blue enclosures. 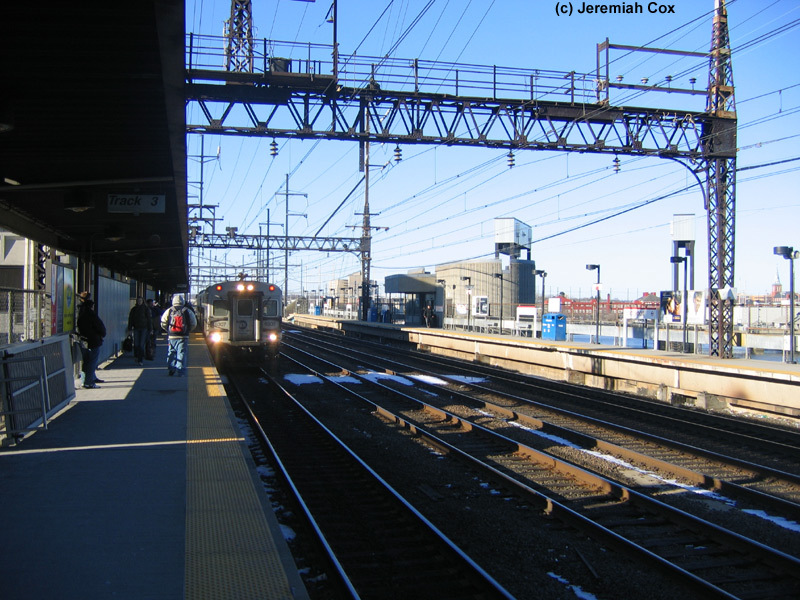 At the northern end, one staircase leads up to each platform and an outdoor opening in a wide pedestrian plaza connects the platform to a modern pier beneath the rail line that leads to Stratford Avenue. 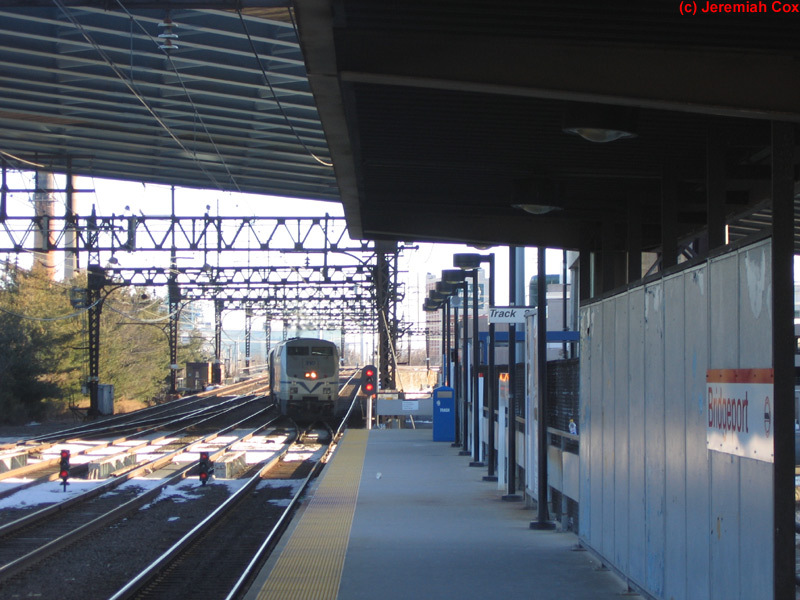 A closed, enclosed by fencing ramp used to lead off the New Haven-bound platform to Stratford Avenue. 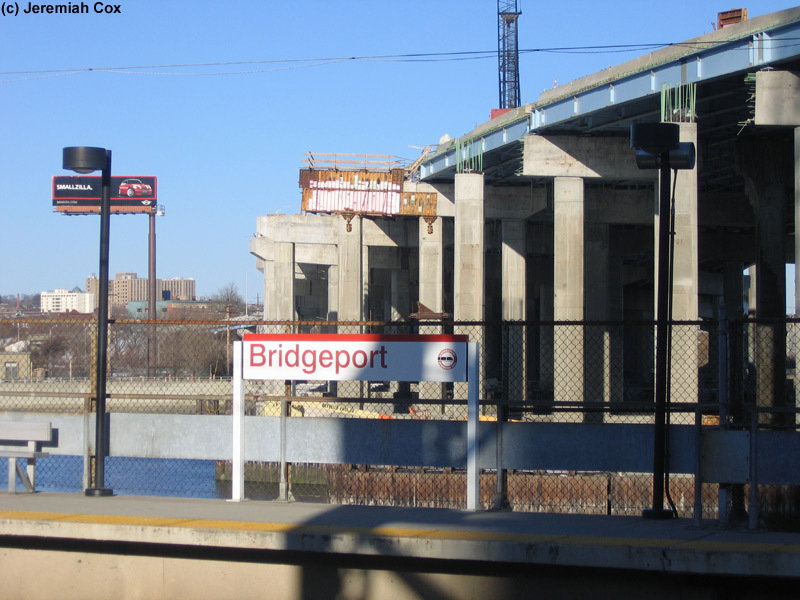 The New York-bound platform has a modern glass skywalk from its end to the 2008 Bridgeport transportation center bus loop. The final entrances are staircases at the southern end of the platforms. These lead down to a narrow driveway that provides access to the port area below. 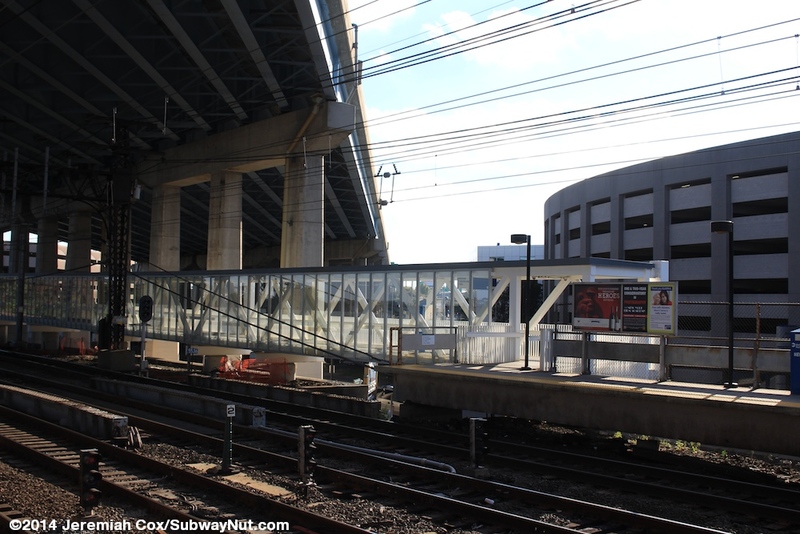 A final white and glass Skywalk over 650 feet long leads off the New York-bound platform only, also under I-95 to the middle level of a parking garage that is part of the Bridgeport Transportation Center.